I’m beyond proud and excited to announce that Lyra and I were chosen to be members of this years AKC European Open Junior Team USA, and that we will be heading to Switzerland this summer to compete at EOJ 2019!!! This is proof to never give up on your dreams no matter what blocks are put in your way, proof to never give up on your dogs, and proof that anything is possible with determination, positivity, hard work, and confidence. Receiving that phone call yesterday morning after waiting for three years for the opportunity to try out, not being able to go with Indi because of his docked tail, after not being sure where Lyra would be by March, and this being my last chance before I age out...I broke down in tears from the shear fact that our dreams are coming true. With Lyra, destiny does exist. When Lyra found her way into my life a year ago; I set our goals, chose my dreams, and through the ups and downs I chased them. 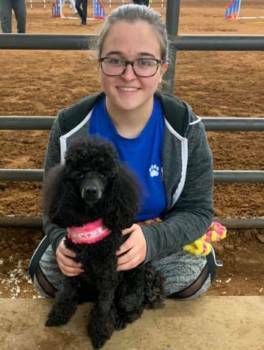 So here’s to the incredible 21 month old Miniature Poodle that found her way to me a year ago, stole my heart, taught me so much, and together we’re making dreams come true❤️ I can’t wait to go compete overseas this summer!!! Thank you so much to the EOJ staff for giving us this incredible opportunity; thank you EstEstelle for keeping Lyra open until we decided we could take her; thank you so much SuzSuzi for bringing us together, for the constant support and for believing in me from the beginning; thank you DebDebbie for being an incredible trainer and inspiration for me since I was 10 years old; thank you CasCassandra for getting us over the teeter hump; thank you to DebDebby for coming up to me at PCA 2 years ago and putting a bug in my ear, and showing me its possible; thank you to everyone that has encouraged and supported me over the years; and thank you to my amazing parents for allowing me to follow my agility dreams! 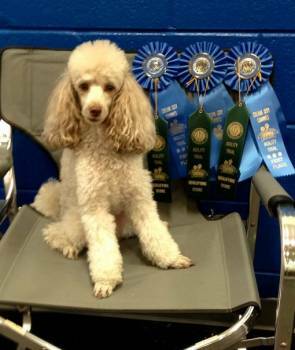 We have a National Agility Champion! 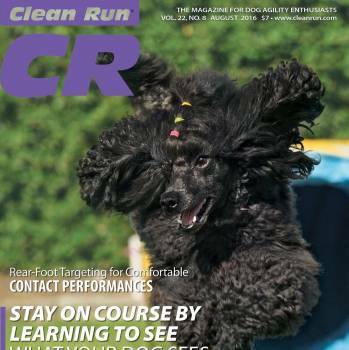 Look who made it o the cover of Clean Run magazine??? 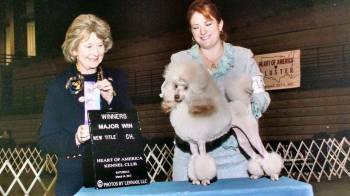 As of January 2016 "Vela" is the number ONE Poodle in AKC Obedience! 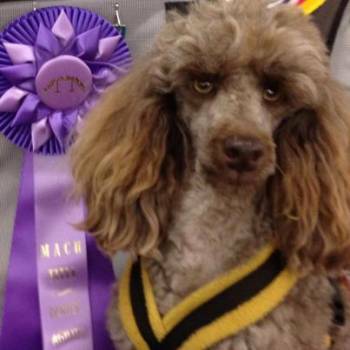 WE have a new AKC Obedience Champion. 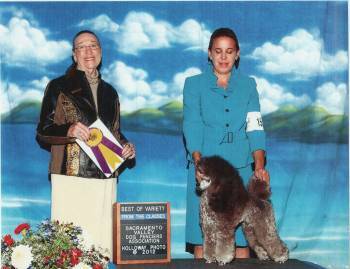 Congratulations Evelyn Gansfuss and "Vela" who is a Deck/Evie daughter from Janco Miniature poodles with Janet Collins. We have our First New Year AKC CHAMPIONS! "Misty" owned by Linda Puckett. 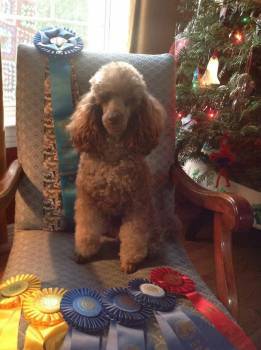 Trendi finished her AKC Championship Jan. 24, 2015 at 11 months of age. Our First New Year pups have arrived. 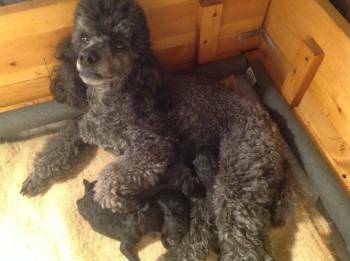 Cyndi and Deck would like to welcome their first litter together. Four boys born Jan. 12, 2015. 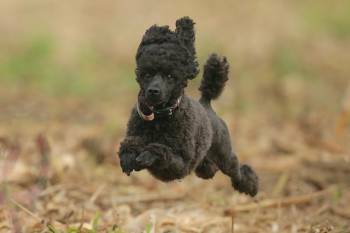 Safranne miniature Poodles has entered the Hunt Field Work! 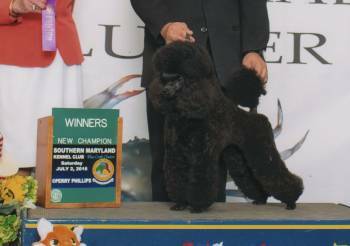 We have a New CHAMPION AT SAFRANNE MINIATURE POODLES! Introducing CH VanTan's Girls Just Want to Have Fun, aka Cyndi. Cyndi is the final Maggie x Benny champion. Congratulations, Estelle Kapsner! Thank you for letting her stay here and be shown. Cyndi is home with Estelle now and is joining the Safranne team. Have fun, Cyndi! We love you! CH VanTan's Girls Just Want To Have Fun, aka Cyndi....the final Maggie x Benny champion. Congratulations to her co-owner, Estelle Kapsner, who is Cyndi's new Law and Order watching buddy. Cyndi will start working on some new titles for the other end of her name next! Thank you to judge Mrs. Houston (Toddie) Clark for finishing our girl! NEW Agility Title in the Family. 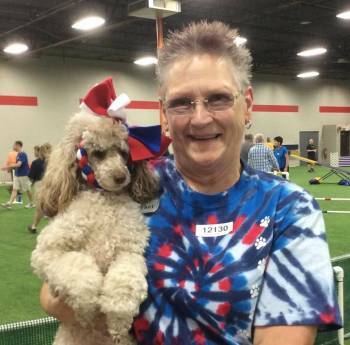 Barb and Jiblet have a new AKC Open JWW title on the 4th of July! Way to GO Team JIB! Barb Mars and Jibblet or as we fondly refer to as "Team Jib" receive their first CATCH on May 25th, 2014. Here is our Ch Safranne's Dream Cruiser doing what comes naturally. Thank you Terri and Alice for giving him this chance to live up to his potential. It is the Therapy dogs that are the hidden heroes amongst all the breed and performance lights. 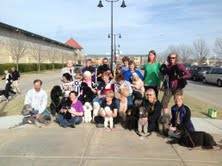 Well here is a big CHEER for the beacons of the Therapy Dog World! Congratulations Terri and our own "Cruiser". We are very proud of both of you. Teri and Cruiser ready to present Teri's Masters paper on Animal Assisted Therapy in the schools. So proud of her and Cruise. Alice HoweIt is by far the greatest love that these dogs give so freely. Cruiser has been a God send to so many children. Better than any title any day:) good job Estelle Kapsner. And for Teri presenting this program. Schools need these dogs in the schools to aide these kids. It is truly amazing to watch. 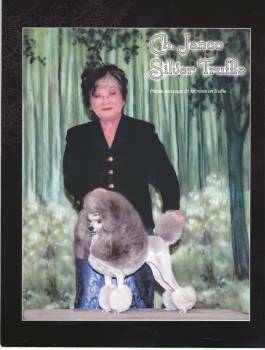 Thank you Estelle Kapsner and Safranné Miniature Poodles for sharing such a wonderful dog with me. Carter spent the whole day in my kindergarten classroom. He was a rockstar! He was calm, affectionate, playful with all 17 children. He made a special connection with a student with special needs. I know we will have fun doing performance sports together, but seeing him touch the lives of other people is his best gift The children were bummed when he needed to take a few naps in his crate. Both Carter and the children are looking forward to an encore visit. We have two new Champions! AKC Championship Jan. 18, 2014. We have a new home bred Champion! 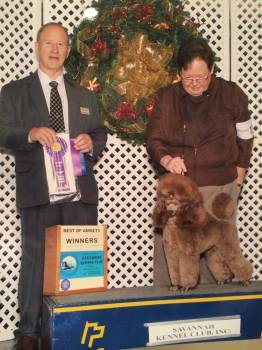 Safranne's Silver Sails Heart Breaker finished his AKC Championship. Breaker just turned a year on July 7th and he is a Champion on July 21st. What a year it has been. Thank you judge Michael Dachel for his CH win. completed his in July 2013. 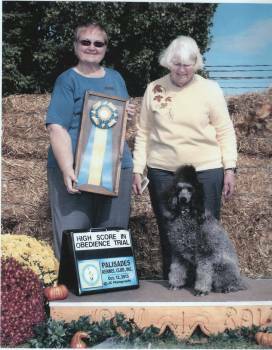 Vela is our Safranne/Janco family Obedience Star. Here are Vela and Evelyn, a High In Trial team. Vela is a littermate and sister to Truffle pictured below. 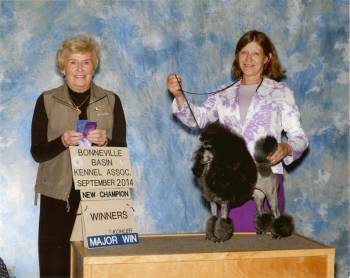 Am Champion Janco Silver Truffle is a "Deck" daughter and his first AKC breed champion pup. 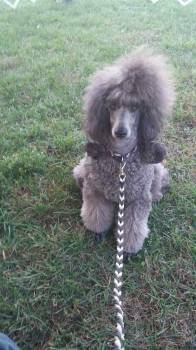 Truffle belongs to Janet Collins from Janco Miniature poodles in California. 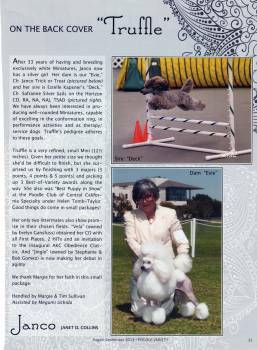 These pictures are from Poodle Variety the Oct. 2013 issue. 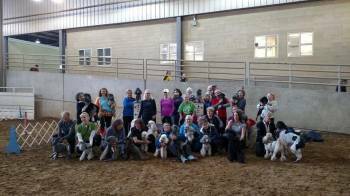 JIB turns 13 years old and we have the 3rd annual JIB Family Reunion Agility trial and Birthday Party. 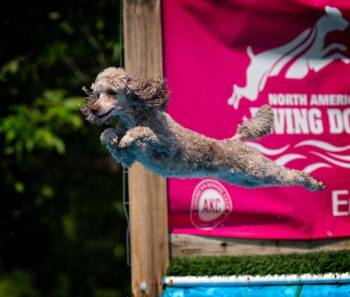 Mach Safranne's Jumping Jack Flash aka "Jagger" with Maggie Schoolar and Kim Johnson with Jib son "Hobbie". 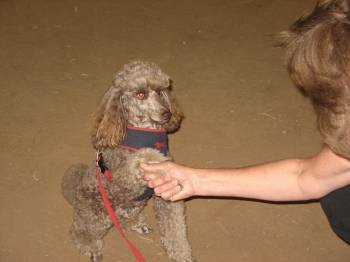 "Jagger" giving out the "Team Handshake" to his owner/handler Maggie. Cassie Schmidt with Bliss a JIB daughter and Kitty Bradley with "Penske" a Deck/Mia son. 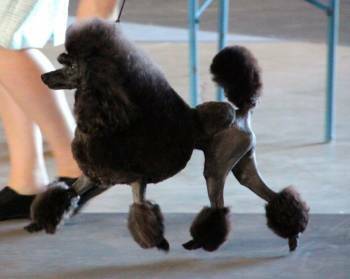 "I checked the 2013 Invitational Poodle points last night and Jagger is 13th! That is before our great weekend! 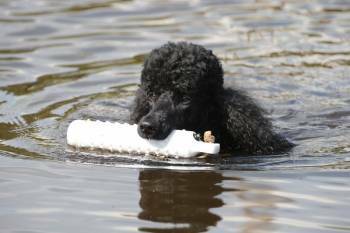 Very exciting I see you have several Safranne poodles in the top 25! I started thinking if we trial every weekend and qualify 80% of the time and ……. Then I came to my senses. Agility is so much more fun when you are there to play not to qualify. So I will stay the course and we will just see where we come out and then maybe next year!!" "Jib's 2nd day at Hounds brought more fun and 1st place Q's in Novice JWW and Fast. Very proud of my Safranne girlie"
Go to the Puppies tab and see the latest video on the Deck/Mia litter! CH Safranne Silver Sails on the Horizon and CH Safranne's Surprise Package Miata would like to announce 3 new family members born on Nov. 26th, 2012. Mama "Mia" and daddy "Deck" say "Welcome wee ones." Go to the puppy link and watch the videos to see the puppies grow! MACH Safranne's Jumping Jack Flash reaches his first Mach just 3 days before his 3rd birthday! 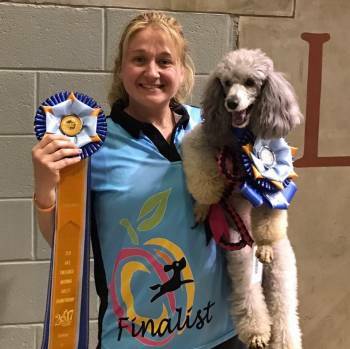 JANCO SILVER TRUFFLE a Deck /Evie daughter owned by Janco Miniature Poodles renowned for their Obedience Performance poodles received her first points in the breed ring! "Truffle" is owned by Janet Collins and is being handled by Kim Russell. Announcing the birth of 5 new Safranne' miniature family members! BISS INTL CH Safranne's Quest for Silver and GCH Kallista's King of Swing at Van Tan's would like to introduce you to their brand new 3 sons and 2 daughters. Born on July 7th, 2012. New Agility Title in TDAA. Deck finished his Superior (TSAD) TDAA title 5-19-2012 and is now starting his TACH Q's. Hopefully we are on a roll! 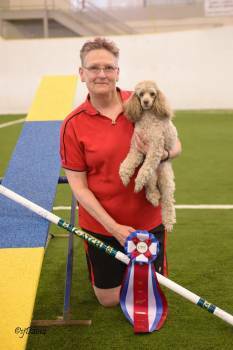 Deck finished his Tea Cup Intermediate Dog Agility title and has moved on to Superior! 2-11-2012. Deck has 4 new daughters! 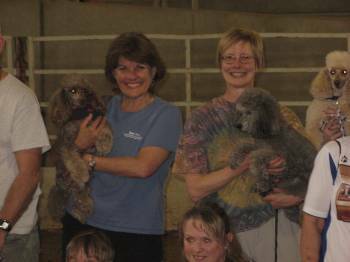 On December 9th of 2011 3 girls were born in California to Janco Poodles. 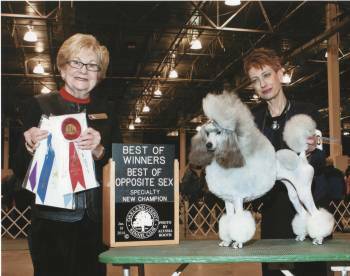 Janet D. Collins known for her her stunning white mini poodles which excel in the Breed ring and Obedience Performance received from AM CH Janco Trick or Treat aka "Evie" and AM Ch Safranne Silver Sails on the Horizon aka "Deck" three new baby girls. Thank You Janet for giving us a chance to add to your performance blood lines! 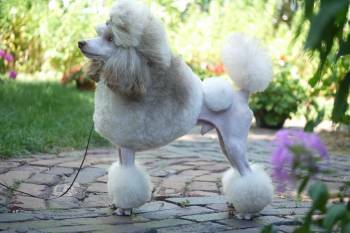 Absolute Silver Miniature Poodles. Congratulations Amy Redepenning and Dori and best wishes for the future! Our 1st Birthday Dec. 10, 2011. Bo and I just got home. 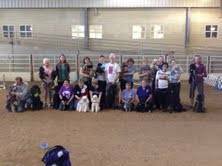 Pat MacLean had a Birthday Party for Bo tonite, there were three of his friends (Braveheart, Ladie and Bella) and owners who helped to celebrate his 1st big day. Thank you so much for letting us have Bo. I hope he is as happy with me as I am with him, he is a wonderful dog. I am very blessed to have him. He is well and thriving. Better go to bed, Bo is already sleeping on the couch. Take Care Keep in touch. Pat W.
I am so happy here...we do lots of fun things. My life is great. Thanks for the good start. Today some of my "cousins" are here in Jacksonville at a USDAA trial. They have Sonic as a Dad. I think he's an uncle. They are all grey and I am very proud to be silver beige. everybody says that I am beautiful. Thank you Mom and Dad and especially Estelle for being up at 2:00 AM and all the hard work and TLC to follow! http://www.youtube.com/watch?v=l0rw571YoDM Check out Moka's first year with Marty! Moka tries some mini courses for the first time. Lots to learn! Lots of fun. Happy Birthday to Boom and Moka from Jack! Chin scratches from Kathy for Mia and Deck! It has been a very good year indeed!